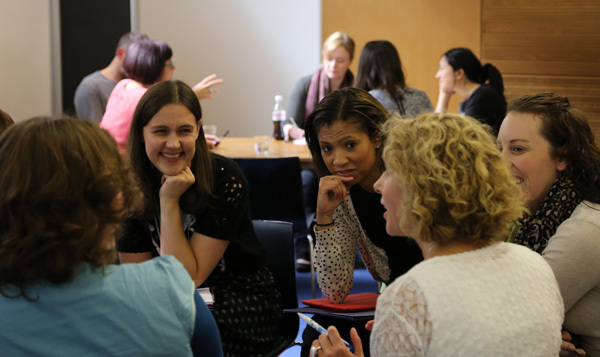 On the first Friday of September 45 delegates descended on the Ashmolean Museum for a discussion of how museums can better understand their audiences. The aim of the day was to explore how organisations can gain insights into their audiences, actual and potential, physical and virtual, and how this understanding can be applied to engage new audiences and ensure the best possible experience. I was both excited and nervous to start off the day, sharing with delegates our experience at the Oxford University Museums of starting from scratch with a new audience evaluation system in 2012. I’ve blogged the details of my talk separately, and you can read it pretty much in full here. In this blog I would like to highlight some of the lessons and top tips I took away from the other talks. Sam Skillings, Head of Marketing at Compton Verney, gave a fascinating talk on how they utilise their audience research data to inform their marketing a communications activity. Sam described how she recently created a mind map of the sources of information she does have about the gallery’s visitors – not always from the most obvious places – which demonstrated both that she had more information available to her than she thought, and also clearly highlighted the gaps where more work is needed. Since Sam started she has proactively been working to improve the information that Compton Verney has on their visitors. One of the first things she did was speak to the established front of house team who engage with visitors daily to ask them what they thought the profile was, though their opinions were divided. In order to get a clearer picture Sam and her team provided new training for ticketing staff on collecting data along with sales, increasing their success: where they were recovering data from around 40% of visitors they are now recovering 70%. Sam feeds the postcode data they collect into MOSAIC to gain further insights. For Compton Verney, visitors within a half hour drive time radius are a key audience, so they recently conducted focus groups with representatives of that population, both visitors and non-visitors, to improve their primary, generic marketing leaflet. Previously designed by committee (we’ve all been there!) the focus group gave a really clear steer to help redefine the material. Rather than seeing key works of art from the collection on the cover, people unfamiliar with Compton Verney wanted it to be clearer at first glance what exactly Compton Verney is, and what is has to offer; they now regularly feature images of the gallery and grounds, plus inset images highlighting things like the galleries, family activities and the café. Also, the focus group thought that the brochure could make it more apparent that there was a lot happening at the venue and that there was reason to return following initial visits. Now the brochure features a calendar style display, clearly providing information about what’s on, and visually highlighting the busy calendar the vibrancy of the venue. Since making these design change more leaflets have been picked up in the past 5 months than in the entire previous year. Redemption of vouchers included in the leaflet help Sam and her team track its impact. Sam has also been working on the gallery’s online communications, adding new dynamic content to their monthly e-newsletter. They created a simple slide show based film for one of their recent exhibition – not an expensive film, just bringing together images, music and text in house – and it has been the most clicked content they have had; though new menus remain extremely popular! In addition to their monthly newsletter they have also begun to send out more regular bulletins in relation to single events, giving people an extra reminder. Often there is a concern that increasing communications will cause people to unsubscribe, but Compton Verney found that those who unsubscribed had not opened a bulletin in the last few years, so they were not engaging with those audiences anyway, and it in fact helped clean up the data. At the end of her talk Sam also shared with the group her experience of benchmarking schemes, leading into broader group discussions. Sam has had a mix of experiences. She has been involved in large benchmarking schemes which can be a real challenge: there is time and effort involved in collecting data in the correct format; it can be a challenge for a group of varied organisations to identify shared research goals; and there are challenges in identifying key comparisons – if the benchmarking is geographically based organisations can be very different in size and goal. One of the most positive benchmarking experiences Compton Verney has had was with an Arts Council funded partnership project with Banbury Museum and 78 Derngate The Charles Rennie Mackintosh House & Galleries to benchmark their audiences and conduct research with the local population living in that area where Oxfordshire, Warwickshire and Northamptonshire meet within the driving radius of all the venues. The agenda for the research was set by the venues themselves, they actively selected organisations against which they thought it was appropriate to benchmark, which in turn meant the outcomes closely aligned to their needs. One point Sam emphasised throughout her talk, when discussing benchmarking or internal research is that organisations need to be ready and willing to respond to that research and make changes, or their value is severely undermined. 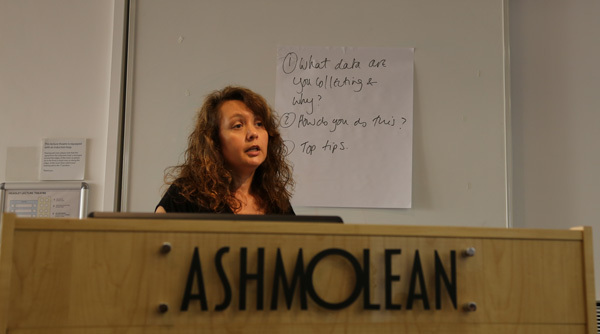 The highlight of the day was a talk from Shelley Mannion, Senior Content Producer at the British Museum. 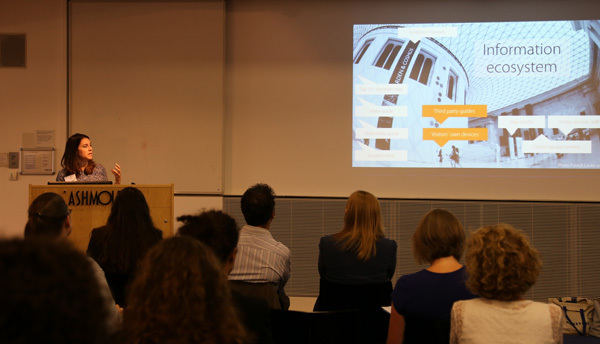 She shared with us some of the findings of a recent 6 week research project into how visitors orient themselves when they arrive at the British Museum and how they use the museum’s multimedia guide. This talk tackled the issue of understanding audiences from a different perspective, looking closely at what visitors do while in the museum, rather than their motivation for attending. As part of the project Shelley and her team reviewed all the audience data collected by the museum, but existing research was not as useful as it could be for this particular project as they were interested in specific behaviours. Consequently the team needed to conduct research on the ground, interviewing visitors and multimedia guide users, shadowing users – what they did and what they said they did often varied significantly – and eventually prototyping with new ideas. Upon arrival, museum visitors – in the UK at least – turn left! While there can be a perception of audio and multimedia guides as a solo activity, most users actually experience them in a social way, listening and then sharing information through conversation, or actually sharing the guide itself or headphones. While museums often focus on the point of arrival as the primary opportunity to influence visitors’ behaviour, there are other considerations. Visitors to the BM in particular often come to see a specific object or display, and it is after they have achieved this objective that the museum has the opportunity to steer them towards other activities. Tools – do they bring a smartphone, guidebook, do they pick up a map? Movement – do they pursue a structured path around the gallery or take an unstructured wandering approach? Aim – is their purpose specific or vague, do they feel strongly about it, or is it a weaker inclination? Shelley emphasised to the group that their initial reason for visiting does not always remain the same throughout their journey; it can change significantly once they meet their initial aims. Shelley noted that visitor experience was a particularly high priority for the British Museum as for many visitors, especially international tourists, this is their one and only visit to the museum, a once in a lifetime experience. It is very important to the museum to live up to those expectations. As a final top tip Shelley pointed the group towards the Google Cultural Institute’s mobile builder service for cultural organisations, which although still in development, is useful for prototyping new products, especially as they provide good, solid analytics. Unfortunately due to unexpected circumstances our final scheduled speaker could not make it on the day. 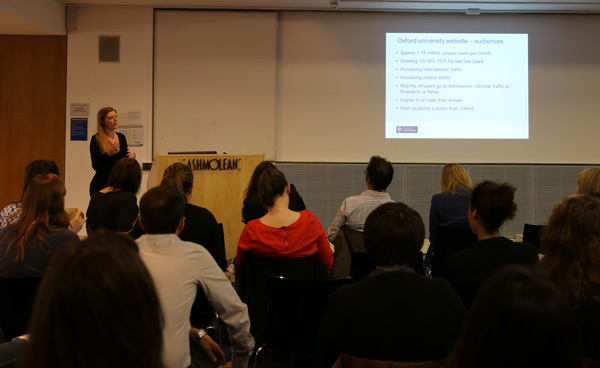 Fortunately, with less than 24 hours notice, Suzi Ardley, the Head of Digital Communications at the University of Oxford, stepped in to share her knowledge of understanding online audiences beyond the basic Google Analytics tools commonly used. Prior to her current role Suzi was the Communications Manager at Monash University in Australia, and the Digital Marketing Manager for the Science Museums Group. Suzi explained how she uses personas to assess whether a website or digital platform is fit for purpose. They develop descriptions of individuals who they would expect to engage with a site, profiling them as a person and their goals for visiting the website. Based on this profile they explore the website from this user’s perspective and identify frustrations where content is missing or difficult to locate, and also opportunities to direct them towards additional relevant content which the user may not have independently identified as ‘for them’. Suzi explained how they similarly conduct user testing with target audiences, for example local secondary school students who represent a demographic who might consider applying to the university, and ask them to complete certain tasks on the website and feedback on their experience. They track direct and indirect success as well as failures and use this information to improve the website. Suzi also explained how they use a tool called Crazy Egg to identify where users click on a website and how they individually tag homepage content to track how people behave when they arrive on the university’s homepage – the main point of access for web visitors. While these activities relate specifically to improving website usability, Suzi also shared some additional ways you can gain a greater understanding of your visitors using basic analytics tools (and not just track number of visits and time on site). Suzi explained how for both website and social media stats looking at the country of origin of visitors can be useful. For example the UK is 6th on the list of countries in terms of number of Facebook Fans, indicating that the audience engaging with the university’s Facebook page are not current students, but represent a more aspirational audience. On the website UK users a more prevalent, but location information shows that they are predominantly from London and Oxford, so there is still work to be done to broaden appeal to other parts of the UK. Spikes in traffic in certain areas can also be linked back to widening participation activities targeted at these areas and can be a reflection of their success. Keyword Analysis: Wordtracker, Hitail, Google Adwords and Google Keyword Tool. For me the day was hugely interesting. As you will see from the blog of my talk, we have concentrated so far on increasing the evidence base available to use about our physical visitors, moving from a relatively minimal position to a much more robust system. Listening to the talks and speaking to colleagues on the day gave me a lot of new ideas about how we can apply this information to our activity. Now that our physical visitor research has improved, it has driven me to start thinking about how we can develop our understanding of our online visitors. Finally, as we start to develop more in gallery mobile content it has encouraged me to concentrate more on how visitors behave while in the museums. In our group discussion when we were sharing top tips on understanding visitor behaviour stalking (otherwise known as shadowing) was described as a great source of information – I will be investing in a new trench coat and sunglasses.